Here we have a console that really shine with lots of original great games! Getting back the old favorites in much better quality was fantastic. Super Mario, Zelda, Metroid and Punch out were all fantastic improvements over it's predecessors. The SNES had implemented a texture mapping feature called Mode 7 which allowed a background layer to scale and rotate leaving an impression of 3D graphics. 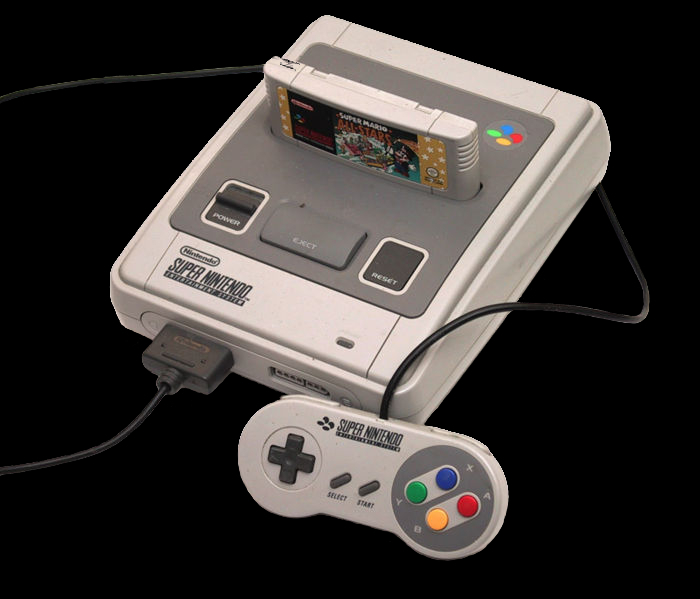 The SNES could actually render real 3D polygons with the help of the Super FX chip which did not reside inside the console, but in the cartridge of those games which needed it. The games combined the polygon rendering with scaled bitmaps due to the very limited polygon count. Some games used the Super FX chip only for assisting with the more advanced 2D effects. The SNES took my fighting game skills to a higher level with the superb arcade conversion of Street Fighter 2. My former favorite fighting games had been International karate +, Budokan and Panza Kick boxing for the Amiga. I was so excited reading about it in all the international gaming magazines, that I bought the Japanese version before the others came out. It cost me 950sek1 shipping and converter included. Expensive but it was all worth it. The skill level was a huge leap compared to other fighting games. As this was the Japanese version of Street Fighter 2, the characters had their original names of which I still have a problem letting go of because they fit better. The African-American boxer named "Mike Bison" (abbreviated as "M. Bison") was a parody of real-life boxer Mike Tyson. In order to avoid any likeness infringement lawsuit from Tyson, Capcom rotated the names of three of the boss characters for international versions of the game. The final boss, called Vega in the Japanese version, was given the M. Bison name. The talon-wielding Spanish warrior known as Balrog in the Japanese version was renamed Vega, and the boxer became Balrog. I wonder why Capcom rotated the names instead of getting a new name for M. Bison. That would get rid of the confusion of who is who. As people gave up playing against me because I kicked their but, I tried to compensate by playing with my feet. The joystick of the SNES was not very feet friendly, but it worked and it was a lot of fun. 1. At the time around 100usd. 2. Known as Contra III: The Alien Wars in North America and as Contra Spirits in Japan. The European version is identical to the American release, but replaces the original commandos with robotic soldiers codenamed RD008 and RC011.